One more young person in recovery from cancer will have the chance to get their life back on course after treatment as a Ladies Tri-Am Golf Day at Largs Golf Club raised £720 for the Trust. Throughout September, the Trust is supporting Childhood Cancer Awareness Month to highlight the importance of continuing to help young people during the challenging, but often overlooked, phase of re-engaging with life after cancer. Largs Golf Club members, Jean Capes and Carol Harrison, organised a tombola at the Tri-Am Ladies Golf Day, which welcomed players from across the region last month, with over 100 prizes donated by local businesses and club members to raise money for the Trust. 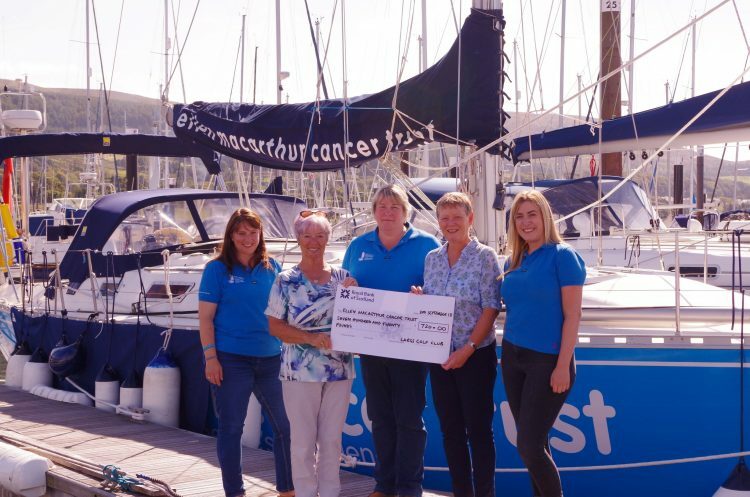 Jean and Carol were invited to present the cheque to the team at the Trust’s Northern base at Largs Yacht Haven and enjoyed a tour of Caledonian Hero, the Trust’s specially-adapted yacht, funded by players of People’s Postcode Lottery. Every day at least 11 children and young people are told they have cancer. Thankfully survival rates are increasing, but life after cancer isn’t always straightforward. That’s why when treatment ends the Trust’s work begins. Through Trust trips young people develop confidence by learning new skills, making friends, talking to others who have been through similar experiences, pushing physical boundaries, rediscovering their independence and no longer feeling alone. They are supported, empowered and inspired to re-engage with education, employment, relationships, and society. Since launching in 2003, more than 1,900 young people have sailed with the Trust in recovery from cancer. After the opening of the Largs base in 2013, 727 young people have sailed with the Trust for the first time or as part of its ‘Return to Sail’ programme in Scotland, while this summer, in the Trust’s 15th year, 206 have enjoyed trips from Largs. Show your support during Childhood Cancer Awareness Month by signing up to the Trust’s Great South Run team or plan your own fundraising event like the Tri-Am Golf Day. The only limit to what you can do is your imagination! It may be about pushing your physical or mental limits or doing something fun with friends, but what you do could help define a young person’s future. Could anything be more satisfying than that? Visit the ‘Get Involved’ pages HERE for heaps of inspiration.